Often organizations find it difficult to maintain and manage its huge store of Time, Expense & Invoice data that appear in its project management and time tracking systems. Large organizations deal with numerous clients and may work on multiple projects with one single client. Also, a single resource can be used on multiple projects as well. The bigger the size of the organization, the more complex is the nature of the data in the system. Even the freelancer professionals who work individually or in small groups struggle sometimes to track and trace Time and Expense entries and to generate the Invoices for their clients on timely basis. Therefore, it is important for organizations as well as for freelancers to be equipped with a flexible system that can give a clear and bigger picture of all the activities that are going on, in a whole and in segments. AccountSight has it all to make employees’ lives simple and easy by providing an excellent and unique solution to reporting! AccountSight is the most user-friendly, hassle-free and feature-rich productivity-drivencloud based application that helps to efficiently manage online timesheets and project expenses and generate online invoices without time delay. Not only that, AccountSight also provides a rich powerful dashboard that allows users to generate Time, Expense and Invoice reports with filters to slice and dice the data, right up from project level down to task level. It also maintains online time and billing records by separately keeping track of invoiced and un-invoiced entries. The users can easily understand and interpret the colorful dashboard display and absolutely love the user experience AccountSight offers. 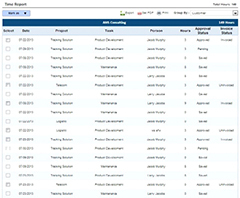 Assigned users can easily drill down from dashboards into reports to review details or can directly move to the reporting section to view or query reports. Any filtered or the combined report can be directly exported to excel for further processing or can be converted into a PDF or can be printed for submission. The administrator has access to all the project reports for the company and can generate consolidated reports. On the other hand, the Project Managers access only the project under his/her supervision and can generate separate reports for those projects only. Is that what exactly your organization is looking for? Are you in search for such a project management and time tracking software for your freelance operations? Then your wait is over! 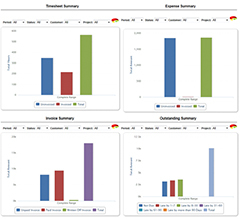 Use AccountSight now and you’ll find the results instantly! Click here to sign up and try it free for a period of 30 days now!